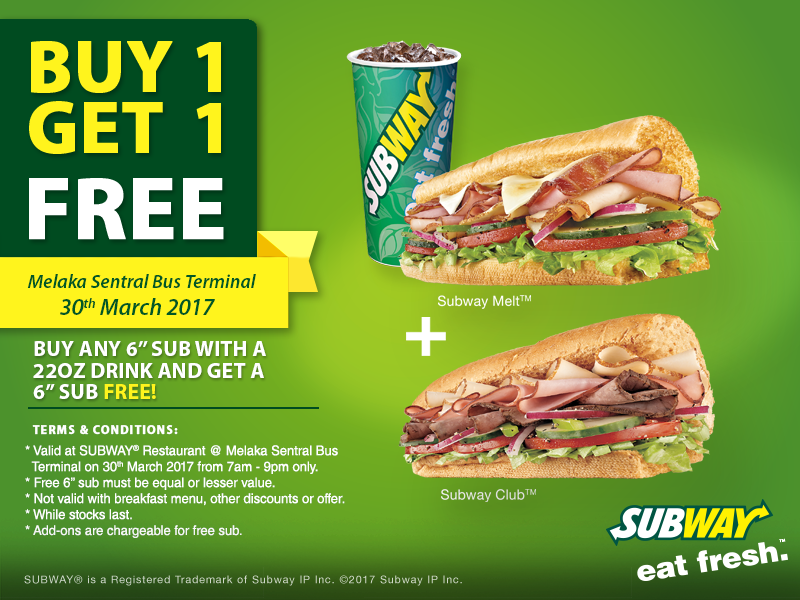 Dear Malaccans, share a sub with a friend with our Buy 1 Get 1 Free promotion at Melaka Sentral Bus Teriminal! Just purchase any 6” Sub with a 22oz drink and you will get a 6” sub for free! Better hurry and enjoy this promotion on 30th March 2017! Valid at Sunway Restaurant @ Melaka Sentral Bus Terminal on 30th March 2017 from 7am - 9pm only. Free 6″ sub must be equal or lesser value. Not valid with breakfast menu, other discounts or offer. Add-ons are chargeable for free sub.